Customize your POS screen with the specific function buttons you want your staff to use; hide the buttons they’ll never use. Custom Menu board with up to 150 button positions per page. Unlimited one-touch PLU/Product buttons that sell non-labeled items quickly and easily. Classification buttons display multiple pages of one-touch products linked to specific groups. Modifier buttons let you add free or chargeable modifiers or descriptors to any PLU/Product. 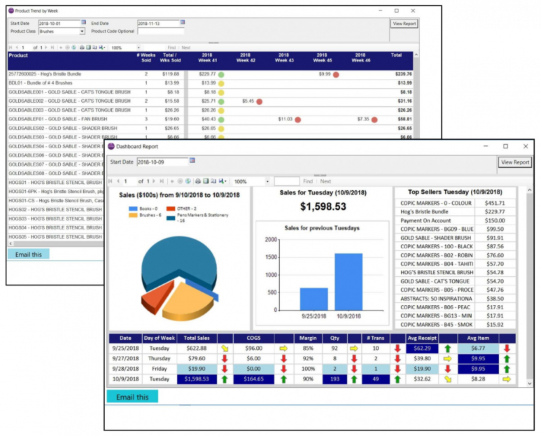 Program buttons execute 3rd party apps like MS Excel and MS Word, or open a web browser, or run user defined reports leveraging data within the database and the POS transaction screen. Display buttons can dynamically display customer or item data during sales transactions. Extended Till Roll (on-screen receipt list) for retailers that sell lots of items in each transaction. 11 different color themes and options for squared or rounded buttons let you personalize the look and feel of each POS device. Charge special customer pricing and automatically apply customer-specific discounts, regardless of which location they visit. Create customer rewards programs and control how rewards are redeemed. Manage A/R customers by processing and tracking invoices, issuing statements and applying payments to specific invoices. Optional integration to GatherUp lets you easily manage your customers’ online reviews and optimize your online reputation. Optional integration to Send In Blue helps you conduct professional, cost-effective email marketing campaigns and analyze their effectiveness. Sell online, in-store or by phone and synchronize inventory to eliminate stockouts and deliver all your orders on time. Automatically upload product file changes in MyPOS Connect to your eCommerce database. Include online sales with in-store sales for proper sales tax accounting and revenue reporting. Automatically share new customers: New online customers migrate to MyPOS Connect automatically. No manual data entry required. Use MyPOS Connect’s off-the-shelf integration to Shopify or let us work with your web developer to build a customized integration to your eCommerce platform. Create purchase orders manually at Head Office or at the stores. Create PO’s for each store or for a central warehouse for later distribution to your stores. Create purchase orders automatically using reorder levels, outstanding customer orders or sales within a specified period. Import purchase orders from MS Excel. Print purchase orders in multiple formats and email them to your suppliers with just a couple of clicks. Receive purchase orders with just a couple of clicks and print labels/tags based on received quantities. Leverage powerful trending analyses to help maintain optimal reorder levels for each inventory location. 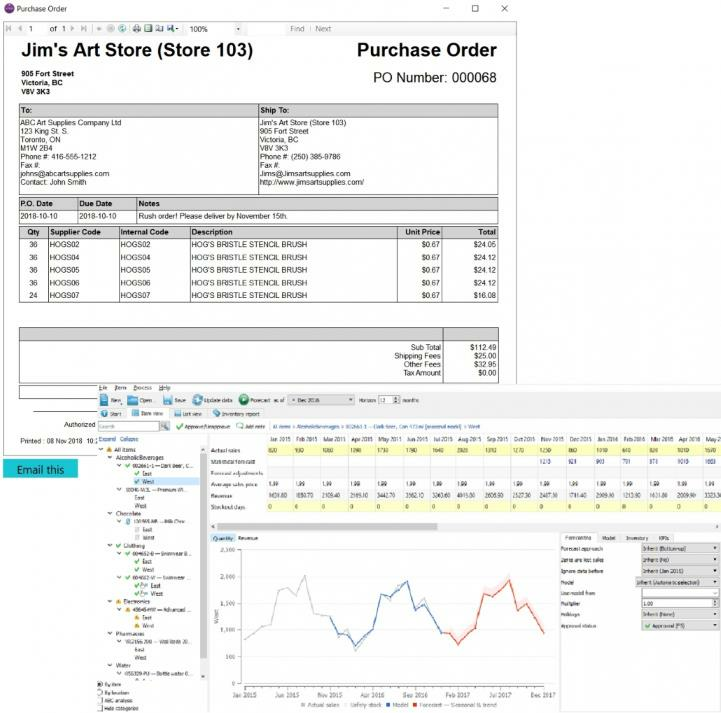 Optional integration to Predictive Analytics leverages sales history to forecast demand, then create suggested purchase orders that eliminate stock-outs and optimize overall inventory investment. Track every item you buy and sell and manage your inventory from your Stores or from Head Office or both. Issue store transfers either from the sending store or from Head Office and manually or automatically receive them. Process Stock Counts with or without portable data collection devices. Make auditable adjustments to stock on hand or to item costs. Receive returned items into temporary “In Limbo” location for further attention by management. Generate detailed inventory movement reports that show you every step your merchandise takes from your suppliers through to your customers. More than 200 standard reports that can be generated from back-office or from the Reports Portal. Access the free Reports Portal from any web browser, anywhere. Customized Dashboard presents key metrics. Use a variety of data filters to focus on critical information. Email any report right from the report viewer. Export any report to Excel, Word, PowerPoint, PDF, XML or CSV format. One-touch report buttons let you display any report from the POS screen with a single touch/click. Modify any report using SQL Server Reporting Services. Optional Interactive Reports Plug-In lets you customize reports without needing a programmer; drag and drop columns, add multiple groupings and calculations, then save the format.